The Union Cabinet recently in an ambitious push for clean energy, ramped up the country's solar energy generation target five times to 100 GW by 2022, from 20,000 MW under the Jawaharlal Nehru National Solar Mission (JNNUSM). This will also greatly reduce the country's reliance on fossil fuels thus reducing our carbon emissions, which is the third largest in the world behind China and United States of America. Currently, India has an installed solar photovoltaic capacity of 3,800MW. To boost the investment in Renewable energy, Japan’s SoftBank Corp. said Monday it is forming a joint venture with India’s Bharti Enterprises and Taiwan’s Foxconn Technology Group to invest about $20 billion in renewable energy in India. All three parties will invest in the joint venture, called SBG Cleantech Ltd., SoftBank said in a news release. 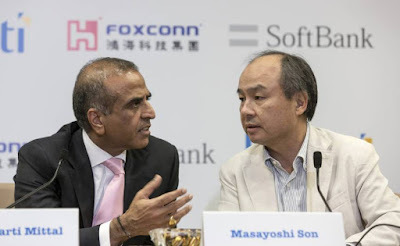 A spokesman for SoftBank said the company’s chairman and chief executive, Masayoshi Son, and Bharti Chairman Sunil Bharti Mittal told a news conference in New Delhi that the joint venture would aim to generate 20 gigawatts of electricity, which would translate to around $20 billion worth of investments. The Indian government wants the country to generate 100 gigawatts of solar power by 2022, up from around 3 gigawatts today. The SoftBank investment follows a similar announcement by India’s Adani Group, which last month said it would spend 600 billion rupees ($9.45 billion) to build a 10-gigawatt solar- power plant in the western state of Rajasthan. Adani said that it would also build a solar-panel plant worth $4 billion along with SunEdison Inc.